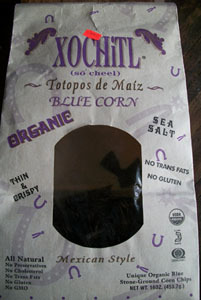 I have a new favorite tortilla chip, Xochitl Totopos de Maiz Blue Corn. Pronounced like “so cheel,” the flavor is unlike any other I’ve had from a store. They taste just like the ones you get in a Mexican restaurant. They’re softer and less dense than other chips. Like Cheetos you can also eat quite a few of these in one sitting because they taste so light. The aroma reminds me of potato chips. When munching on these I’d suggest homemade salsa. Attempts to eat them with guacamole were not as successful because the totopos break easily when dipped. They’re pricier than others but it’s also a larger amount. The blue corn was $4.49 for a $16oz bag whereas most tortilla chip bags are 5-10 oz bags for $2.99-$3.99. They’re so delicious you can just eat these by themselves. The chips are organic and gluten free.